Monroe drivers can find the 2013 Honda CR-V at nearby Middletown Honda. The CR-V compact crossover is one of Honda’s most iconic vehicles, perfect for tackling your latest adventure, torturous New York winters, or what ever the road can throw at it. 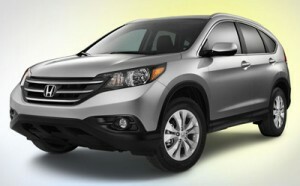 The 2013 model continues to bring the CR-V’s bold look, strong performance stats, and great features line-up. Maybe now is finally the right time take the plunge and try one out! The CR-V has become a standard for compact crossovers. Fans interested in the CR-V often compare it to other models in good faith, like Toyota’s 2013 RAV4. There’s no contest though between the two. The CR-V comes out on top in terms of fuel economy, comfort, safety, and overall value. Fuel economy is a huge point of interest for anyone who is considering a compact crossover, and every mile counts. The 2013 CR-V has an EPA-estimated 23 mpg in the city and 31 mpg on the highway (2WD models),* compared to the 22/28 mpg rating on the 2013 RAV4. You’ll also find Hill Assist Start integrated into the drivetrain of the CR-V. This feature is only optional on the RAV4. The CR-V continues its stellar safety record, receiving a 5-star overall rating from the National Highway Traffic Safety Administration; that’s 5 stars in each category. The RAV4 received a 4 star overall rating, with an abysmal 2-star rating in the side pole crash test. The 2013 CR-V was also a Top Safety Pick for 2012 by the Insurance Institute for Highway Safety, an honor the RAV4 did not receive. Several key features come equipped standard on the base CR-V that are either only optional on the RAV4 or missing completely. RAV4 drivers will miss the power lock feature on the tailgate of the CR-V and need an upgrade to get the rear view camera and floor mats. See more of Honda’s new crossover at our showroom in Middletown. See for Yourself at Middletown Honda! The CR-V continues to have more and more fans every year. Learn more at Middletown Honda, only a 20-minute drive south of Monroe. Don’t hesitate to contact us with any questions or if you would like to schedule a test drive. We look forward to meeting you!